This afternoon I went to see Hollies nativity play at school and Hollie was the star. She looked so cute. They all did very well for 3,4 and 5 year old and sang very well. I will include a photo tomorrow. 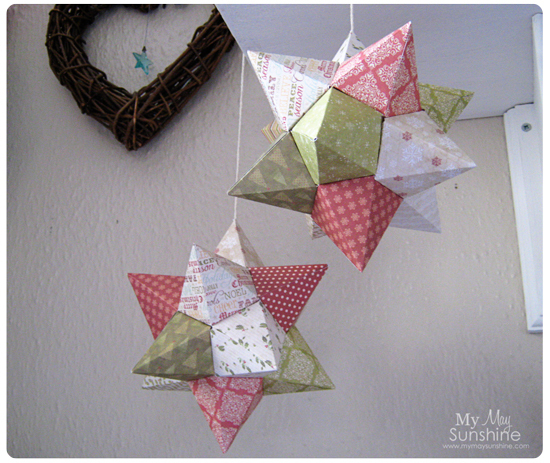 Today I wanted to show the origami stars that I have made, as I made a few things for Halloween using origami so decided to make a origami star for Christmas. This is my inspiration from What Suzette makes. Love the colours. 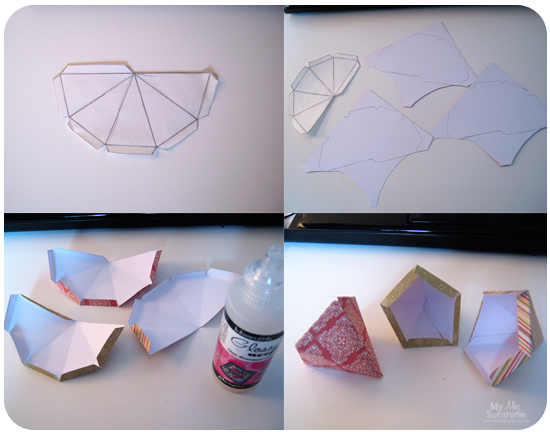 I started with the template from What Makes Suzette Now template and added the flaps to the template. Then just draw them onto some Christmas patterned paper and cut them out, scored them and stuck them together. 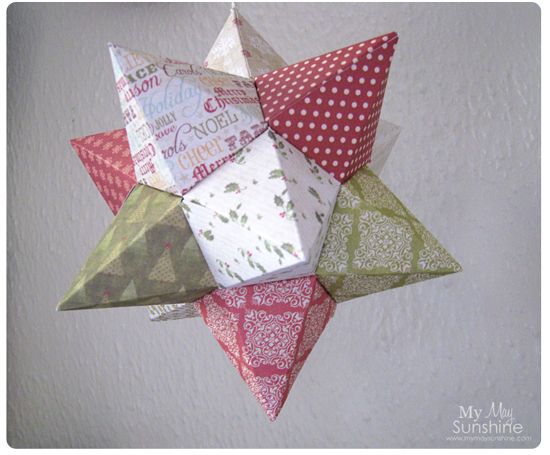 The best way is to do it in cones of 2 and then build up the star but the first one I made I didn’t do this and it was slightly more tricky. Before adding the last cone, I added some string through it so it could be hung up. I used glossy accents to stick the stars together as it allows you to move it slightly before it sets and does stick well but pva glue would work too. I have a florist frog that I use for my cards but this works well to hold the string for the stars as it is a heavy weight and the string just slots into the grooves. I found them quite easy to make and once you start, they don’t take too long and look great. 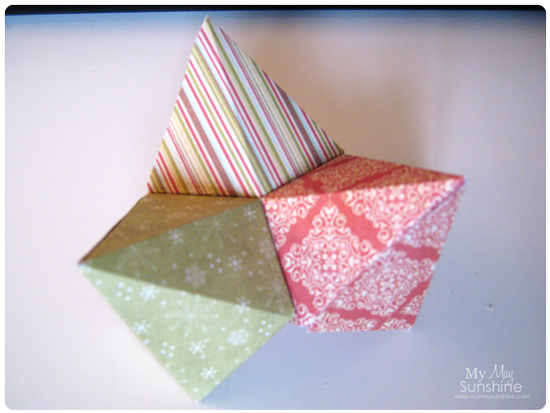 I am loving making lots of crafty things for Christmas and there will be more coming up soon. Have you been making items for Christmas? Leave a comment and let me know. Linked up to A Bowlful of Lemons, Sew Much Ado, Clean and Scentsible, The Shabby Creek Cottage, Yesterday on Tuesday, Chic on a shoestring decorating, Diana Rambles, Polkadot Pretties, Tip Me Junkie, Lil Luna, Chic on a shoestring decorating, Little Inspration. Oh how fun! This is super gorgeous. Pinning! My kids would LOVE to make one! Thanks. My daughter loved how the stars went from flat paper to a star. So pretty! I would love you to come join my Pin Me Linky Party that starts Friday morning at 8am CST. 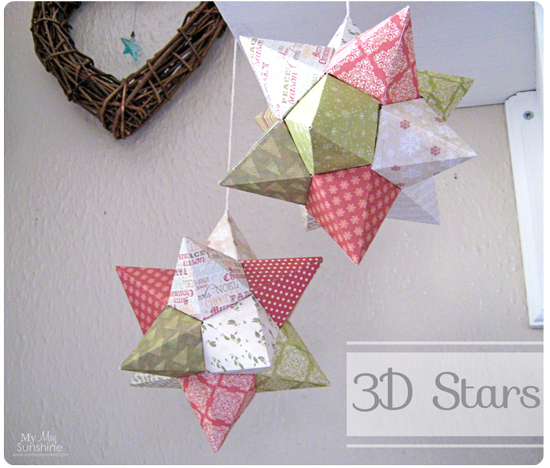 Origami stars looks so nice. I have to pin these. 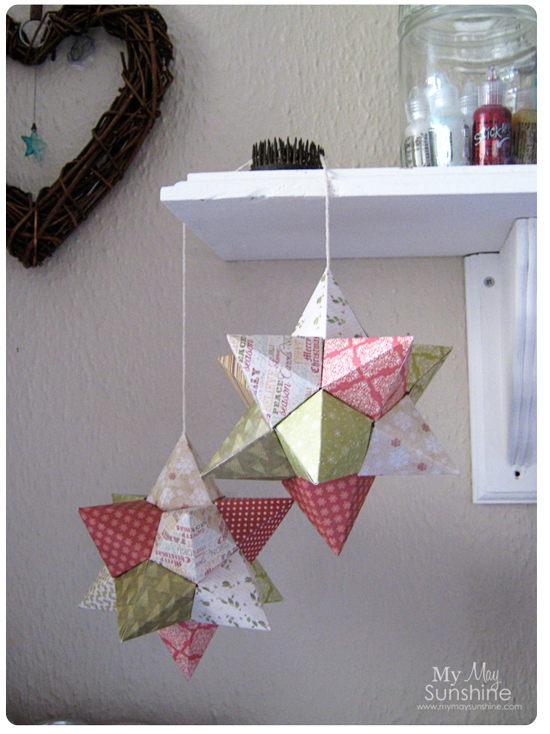 I have a slight obsession with stars and these are so pretty! Merry Christmas. Stopping by from Tip Junkie.